Lachlan Tomkins: “Christians profess a living God, but some attend Masses or belong to communities which seem dead.” Photo: Supplied. 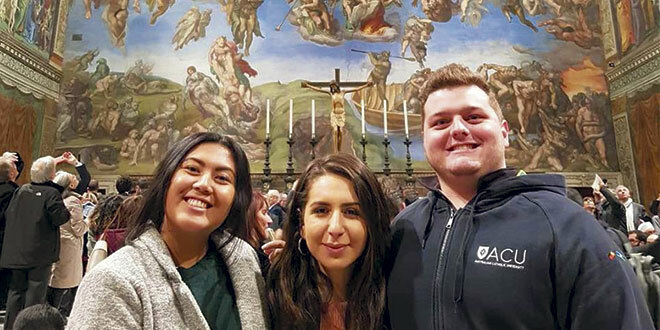 INDIGENOUS Catholic student Lachlan Tomkins says a surprise trip to Rome has given him a thirst to know more about himself, his faith, and to be involved in the Church in a new and enriched way. 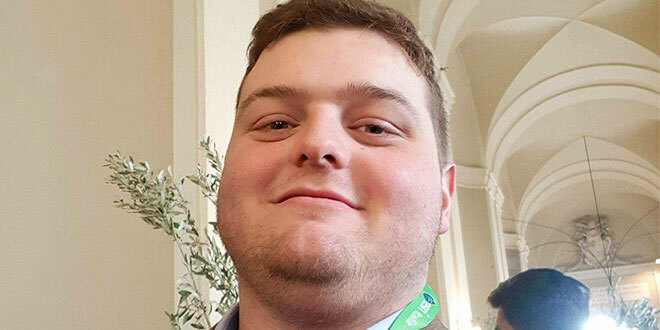 Last month, the Australian Catholic University student, literally, found himself in the heart of Vatican City at short notice, as a delegate preparing a groundbreaking “youth document” for the leaders of the Church. Mr Tomkins said he was at the Weemala Indigenous unit at ACU’s Brisbane campus at Banyo when a senior staff member approached him with a last minute offer to join 300 youth delegates from around the world tasked with preparing a document for the Synod of Bishops on “Young People, the Faith and Discernment” to be held in October this year. “And I said ‘I’d love to do that’,” he said. Mr Tomkins, in his final year studying primary education, said he was given a ticket and next day he was packing for Rome. “I read 40 pages of information on the plane on the way over, and then on our first day we met the Pope,” he said. Mr Tomkins said Pope Francis spent “a good two to three hours” listening and participating at the start of the pre-synodal meeting, explaining the importance of their task – to produce a “youth document” that would shape the agenda for the October Synod of Bishops, and ultimately setting new directions for the Church, including how to better incorporate young people into the Church. 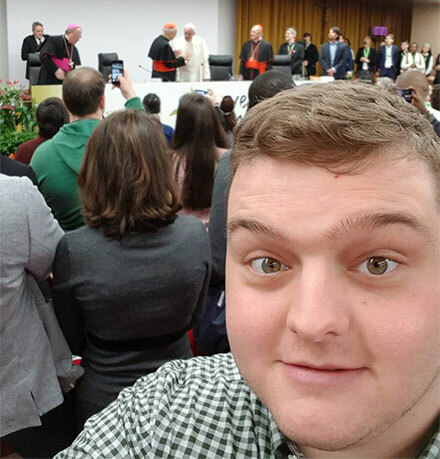 Papal selfie: Lachlan Tomkins takes selfie during the meeting with Pope Francis, showing how close the ACU student got to the Holy Father. Photo: Facebook. Mr Tomkins said being up close to Pope Francis was “phenomenal”. “There’s something about him (Pope Francis) that draws you in, catches your vision, and you just can’t turn away,” he said. The meetings were “a once in a lifetime chance” – an opportunity for Mr Tomkins to collaborate with young Catholics in way that he had never imagined. “I was pushing points about involvement of youth, more community spirit. And some of those points made it to the final document,” he said. In the final communiqué, that can be found on a synod website, delegates noted that many of their peers were leaving the Church in large numbers. Mr Tomkins said his group included an Indigenous Canadian, and the pair lent support to each other considering the future of the Church from an indigenous perspective. He also drew on his own experience growing up in Brisbane, attending Our Lady Help of Christians primary school at Hendra and St Patrick’s College, Shorncliffe. “I was one of those youths who fell out of the Church because I wasn’t involved in any youth group, and I’ve only become in touch with it again at uni, and not as in depth as I used to be,” Mr Tomkins said. It was not until he attended ACU that he became drawn deeply to his Indigenous ancestry. Now, he said, “knowing” about his Kamilori clan from Mungindi, the border country straddling New South Wales and Queensland. “I haven’t met any of my elders, I haven’t interacted with any of my tribe. I’m not initiated in any way which I think is really sad, but opportunities are really hard to come by,” Mr Tomkins said. Mr Tomkins said there were no specific references to indigenous peoples in the final, 16-page pre-synodal document, but he believed references to “those in need of help or support” and those “at the periphery” are a clear enough reference to the plight of first nations around the world. His discussions with other delegates revealed a gap in his knowledge of Church liturgy. “My mind was blown and I wondered why I had missed out on all these fantastic opportunities to understand and know so much more,” he said. On Palm Sunday, Mr Tomkins had a second meeting with Pope Francis – he was among tens of thousands of Catholics attending Mass on St Peter’s Square. “Looking around it made feel connected and that I was part of a much larger picture that can have an influence,” he said. Mr Tomkins said he would take his unique, Roman experience with him when completed his education degree at the end of this year and heads out to teach young Queenslanders. He hopes that will include Indigenous students. “I feel it will give me an edge, a direction, and I guess it will inject enthusiasm in the way I teach,” he said.